How do you say Anitgua anyway? You've probably been making the same mistake Megan makes. Learn the right way and fit in with the locals! Kim Quimby, certified Antigua and Barbuda Specialist, joins the program to talk about this friendly duo. Topics includes, the BEACHES, money, transporation, planning calendar, locals, how not to get eaten by a sting ray and more. Weather you are looking for a couple's getaway or a family beach trip these islands have something for you. They also boast the freshest lobster in the Caribbean. You want to go now right? Kim is accepting referral clients and mentioning the podcast counts! Her first hand expereince and expertise will ensure your vacation meets your expectations. You have limited vacation days - plan them well. Use a professional! A special shoult out the the [10K Dollar Day podcast](https://www.facebook.com/10KDollarDay/), members of the #ladypodsquad. They are the podcast to listen to for fantasy travel where guest dream up fantastical vacations and must spend all 10K over one ful day in a select destination. Go there to dream - come to Travel Radio Podcast to find a professional that can take you vacation dreams and give them life! 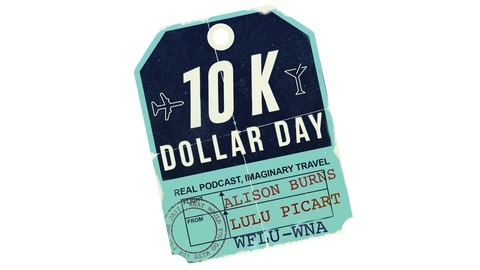 A fictional 10K to spend in one day on fantasy travel and a whole lot of best friend banter! Double K Travel, Kim and Keith Quimby's Travel Agency Website. Double K Specializes in group travel and the islands of Antigua and Barbuda. Additionally, Double K hosts international couples golf tournaments annually.